I get hungry like everyone sometimes and honestly I'm not myself when that happens. You Probably get the same way but that's when I like to grab a Snickers. Yeah, I know that sounds like a cheesy intro to another sponsored post, but it's the truth. Traveling can be tough with changes in time zones, unfamiliar locations, and lets face it you aren't at home with easy access to your fridge and microwave either for a quick snack. However, one thing I love about Snickers is that it has the perfect balance of sugar sweetness, chocolatey deliciousness, and protein from the peanuts (or almonds). It's really a great snack to stick in my backpack for those moments when you need something to pick you up a bit. I like to create over-the-top creations "just because" - that's just who I am and that's what happened last weekend when I found myself shopping at around 10:45 p.m. I was tired, I was hungry, the store was about to close but I needed to make something awesome - did I mention I was hungry? Anyone who's ever gone shopping while they were hungry can probably identify with what happened next. 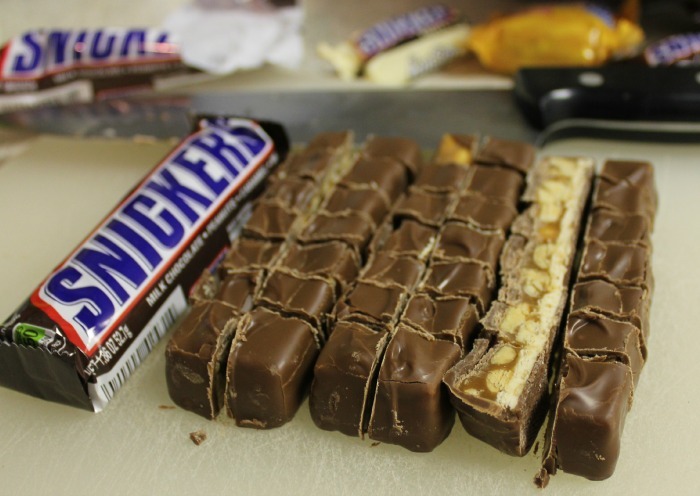 It wasn't going to be enough to simply grab a SNICKERS® bar from the checkout line, I needed to do that AND make the ultimate treat that combined all of the amazing stuff I love in my favorite snack, but also be totally over the top! 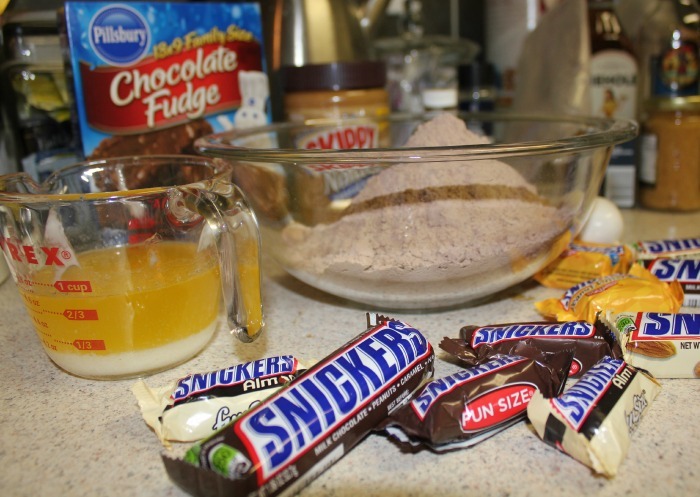 Take Fudge Brownie Mix and place in a bowl with 1 egg, melted butter, water, then mix completely. The directions on your box will probably call for oil and 2 eggs but we want this extra rich and fudgy so just follow my directions. 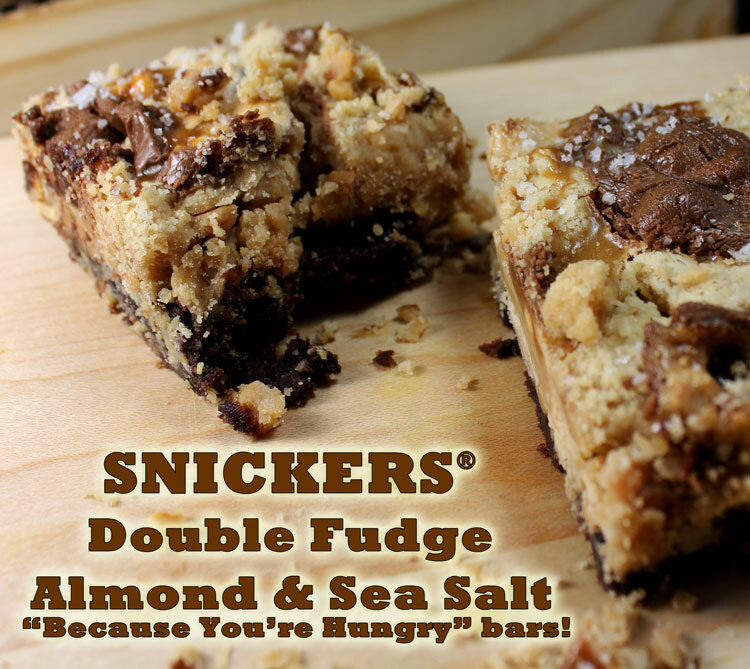 Chop 3 SNICKERS® and 3 SNICKERS® Almond bars into small chunks. I sliced the bar lengthwise and then pencil width slices. Blend these chunks into the brownie batter. BUTTER YOUR PAN - or use a cooking spray heavily. The melted caramel pieces tend to stick really well to the pan and you don't want that since it makes it incredibly frustrating when you try to remove it. Pour the mixture into your baking pan so that it covers it completely. I used a 16-9 pyrex dish but if you want it to be thicker then use a smaller pan. Place into the oven at 350 for approximately 25 minutes. Take 2 cups of peanut butter and 8 tablespoons butter and place in the microwave for 1 minute, checking and stirring every 30 seconds. You will want to make sure to put a cover on top as the mixture may pop and splash. Once the mixture is nice and liquid, pour it into a bowl along with 16 oz of powdered sugar and blend well. Take the brownies out of the oven and pour the peanut butter fudge on top. Your brownies should still be molten and the fudge will mix a bit with it on top. 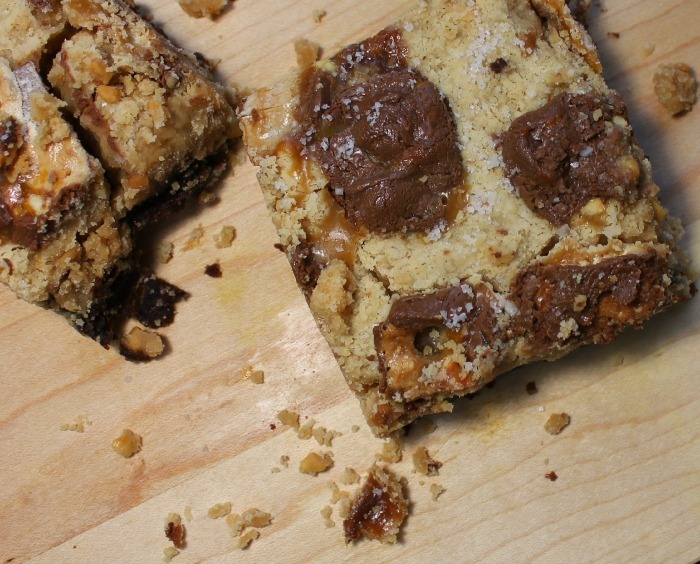 After the peanut butter fudge is spread to completely cover the brownies, take the remaining chopped SNICKERS® pieces and sprinkle across the top of the fudge and gently pat them down so they sink into the mixture. Place the mixture back into the oven and continue baking for an additional 10-15 minutes until you can stick a toothpick all the way in and it comes out clean. Sprinkle the top with sea salt. The bars will still be very gooey and will need to cool before you can cut it, so place it somewhere cool to rest. Once the bars are cool and you've had a chance to cut into them, these are best enjoyed with a big cold glass of milk.